It seems that at the end of the year small businesses like to take a look at what worked over the past year, what didn't, and what they should be doing differently. 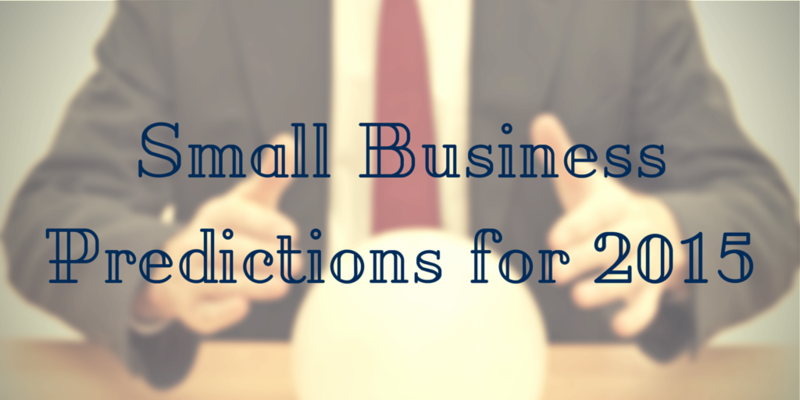 As we look back on 2014, here's my guess on the top small business marketing predictions for the New Year. More small businesses are finally realizing that they need to be doing some sort of content marketing, whether blogging or creating infographics, videos, widgets, slideshows, webinars, podcasts and more. Determining what kind of content you can regularly produce really depends on your time and your budget. 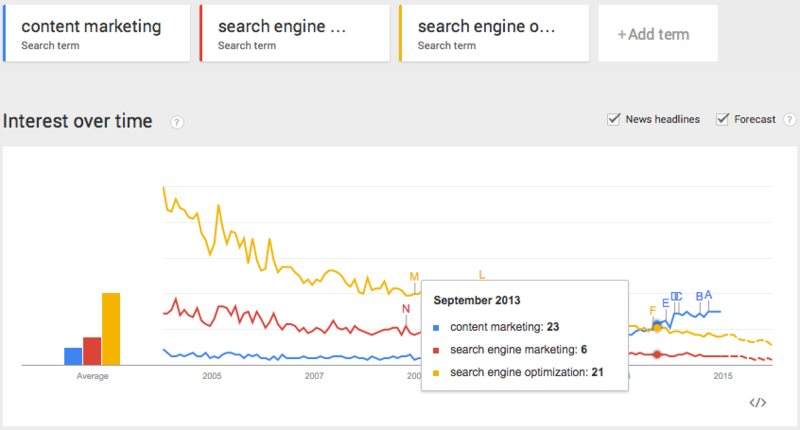 This Google Trends graph compares searches over time for content marketing, search engine marketing, and search engine optimization. As you can see, content marketing overtook search engine optimization in September of 2013, and is forecasted to continue growing while search engine marketing and search engine optimizations are predicted to continue decreasing. You have to continuously be creating fresh, unique, and resourceful content. Ideally this is geared toward helping your customers and audience, but Google also loves original and useful content that helps people find what they are searching for. That's all Google really wants: to bring back the best results for what people are searching for. In 2015, focus on being the business that answers those questions and become the authority in your industry. 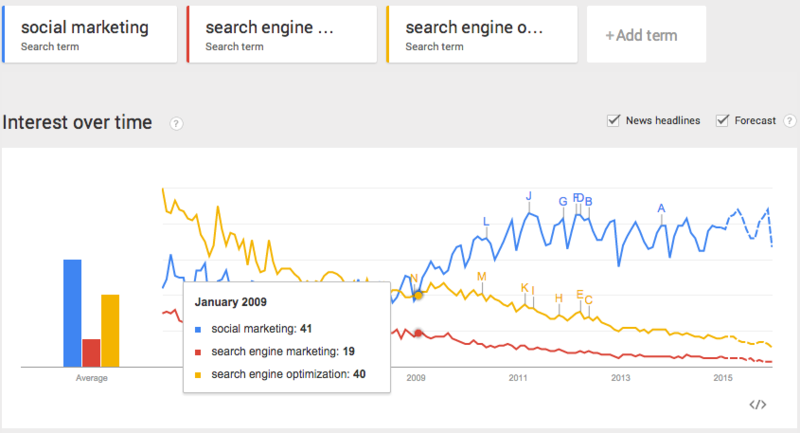 As you can see, social marketing overtook search engine optimization in 2009 and hasn't looked back. We have become a social community, and it's only just the beginning. Businesses will have to be extra vigilant to ensure that they're maintaining a regular online presence, and that their information is accurate. Many social business pages aren’t regularly updated, so they may not have any images, menus, hours of operation, services, or other information that a customer may be looking for. Today most people do research online before going to a business, so when they think you aren’t open - or even when they're just not sure - they will move on to the next one. Thanks to Facebook, small businesses should start heavily using hyper-local ads that target people within a mile of your business. This is great for small businesses that rely on nearby foot traffic. 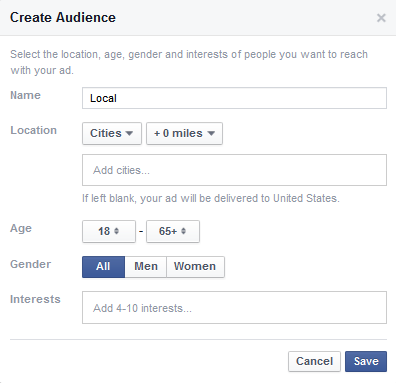 Facebook also has demographic marketing where you can choose all sorts of different age groups, locations, and other metrics to determine your target market for the ads. Depending on your industry, maybe you should start using newer social media platforms like Snapchat, Houzz, Instagram, and LinkedIn. Determining which social platforms other than Facebook, Twitter, and Pinterest are best for your business relies on where your buyers spend their time online. The use of videos and visuals will be on the rise for marketing in 2015. Your only option isn’t just TV commercials anymore because you can use the power of YouTube and Vimeo to reach your customers. Consumers are more likely to purchase after seeing a video then if there was no video at all. In addition, video shows that you are personal with your customers, that you care about your products and services, and that you are there if they have any questions. In terms of analytics, videos will engage your audience longer so that they spend more time on your site. If they find the video intriguing and you have a good call-to-action chances are they will click-thru to other pages on your site or maybe even fill out a form on a landing page. 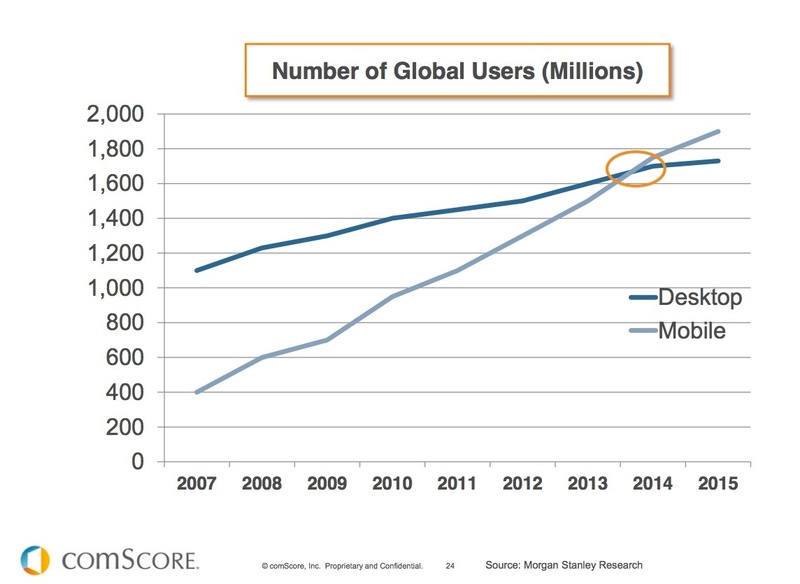 Small businesses must focus now on mobile marketing, as mobile devices have recently overtaken desktop use online. This means that your site has to be responsive in order to attract customers to your business. A lot of people think responsive design is just a trend, but we know that responsive design is here to stay. Responsive websites are built with mobile device in mind, optimizing your calls to action and important copy at the top, while making everything visually appealing and accessible on a smartphone or tablet. It's all about having the best experience for the user, and Google is experimenting with rewarding sites with good mobile experiences and penalizing those that don't in the search engine rankings. Online reviews and reputation management is a huge factor in your web presence. It is very easy to get bad reviews, and you need to know when you get them and be able to respond to them. It’s a lot harder to get good reviews, so you need to be asking your loyal and happy customers to give you a good review online. Maybe you could offer a little incentive or discount for them to do so, which will bring them back for more business. Have a contest or giveaway to entice customers to leave you good reviews as well. We expect small businesses in 2015 to be on the rise thanks to a recovering economy. Small businesses that closed during the recession will start to make a comeback. If you'd like to talk about your business's marketing strategy in the new year, contact us for a free consultation on how to grow your business. I'd love to talk with you!